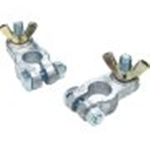 Clamp type wing nut terminal made of lead alloy. Brass plated wing nuts. 3/8" positive stud and 5/16" negative stud. Fits all standard battery posts.